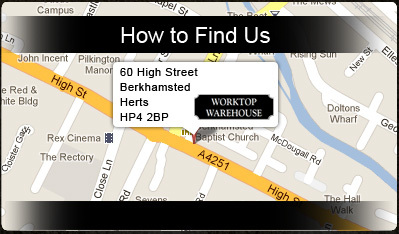 Covering the entire Hertfordshire area and with more than twenty years of combined trade experience behind us, the Worktop Warehouse is your leading independent choice for attractive, functional kitchen worktops in Berkhamstead, Hemel Hempstead and Watford. As one of the premier kitchen showrooms in Berkhamstead, we can measure, fabricate and install kitchen worktops to your complete satisfaction with a customer-focused service that promises complete professionalism at prices that are consistently lower than comparable trade rates. Our experienced kitchen fitters in Berkhamstead specialise in the installation of granite, quartz, oak and hardwood worktops. We can supply and fit worktops of any size in a complete range of colours, style and finishes on properties throughout Hertfordshire. If you have the confidence to install your own worktops, the Worktop Warehouse can meet all of your supply-only requirements with prices starting at just £125. We also provide replacement draws and kitchen doors in Berkhamstead from our delightful showroom where expert advice is always available. Our kitchen showrooms in Berkhamstead provide bespoke solutions for commercial and residential property owners throughout Hertfordshire. Please call prior to visiting to arrange a one to one appointment, this can usually be the same day, with worktops we can give an accurate cost over the phone subject to you having the measurements and cut-out details. Essex Website design by Smart Local Media.